Keeping fans engaged during the off-season means increased exposure for the league's corporate and broadcast partners, said Peter O'Reilly, the NFL's senior vice president of events. Then the NFL moved on to even bigger venues. 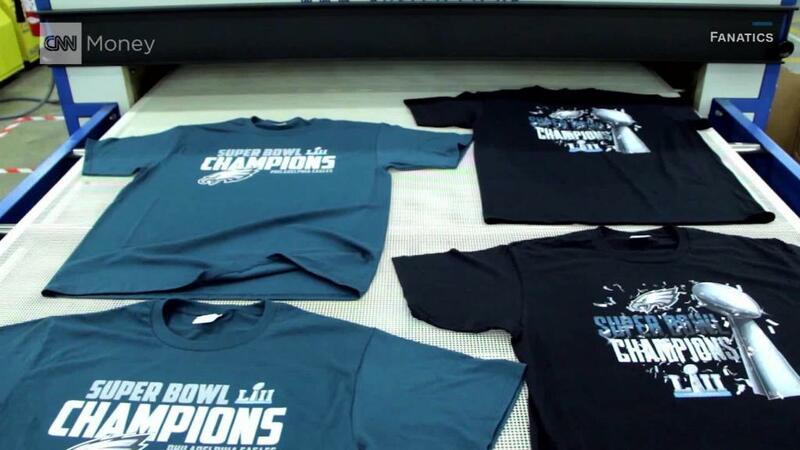 Last year, a record 250,000 people attended the event in Philadelphia. This year, it's being held at the home of the Dallas Cowboys -- the largest stadium in the NFL. So far over 400,000 people have registered to attend the Draft Day festivities. 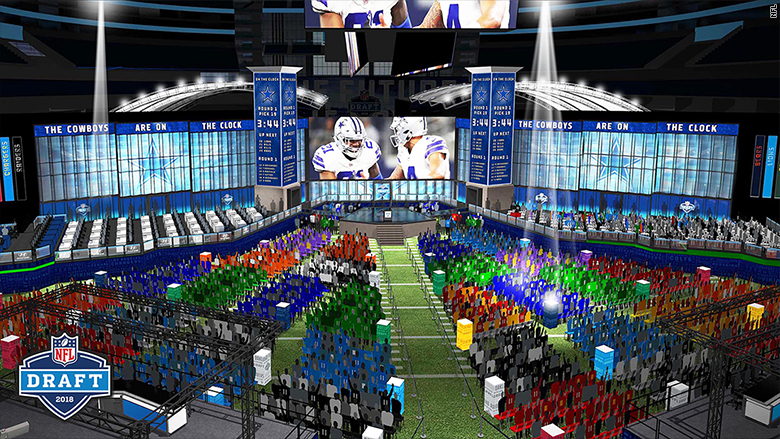 Rendering of the NFL Draft Day festivities taking place at AT&T Stadium, the home of the Dallas Cowboys. (for the stadium one) Rendering of the "theater" that's been erected inside AT&T Stadium to accommodate the 20,000 ticket holders admitted into the draft. The first two rounds of the draft will be held in a portion of the stadium that has been converted into a theater and will host about 20,000 people. The festival surrounding the stadium fills a space the size of 26 football fields and will offer activities and screens to watch the draft, O'Reilly said. The undertaking is so massive that the setup has required more rigging points and screens than have ever been used at the Cowboys' AT&T Stadium. It's all in the interest of rewarding fans, according to O'Reilly. "[Keeping the event] free was key," he said. "A lot of fans are people who might not be able to afford getting into an actual football game, this gets them into the stadium." The Jaguars are announcing one of their picks in London since they'll play a game there every year through 2020. They're announcing another pick in Jacksonville. "By moving the picks into actual markets, it's allowed us to engage more with fans and it's increased interest in the draft," said Jaguars President Mark Lamping. Broadcasters like ESPN benefit from having the rights to another televised NFL event. While ratings to NFL games may be down from years prior, the NFL still delivers the biggest ratings boost for live TV. And the Draft has drawn good ratings. Last year's draft drew an average of 4.6 million combined TV viewers for ESPN and the NFL Network over three days. That was up 6% from last year, and is the second biggest ever, behind 2014. ESPN, which will broadcast the event for its 39th consecutive year, is putting together a production that will include more than 500 player highlight packages, 40 cameras, 30 player live shots and nearly a weekend's worth of around the clock coverage. Seth Markman, a senior coordinating producer who oversees the draft for ESPN, is excited by the scale. "It's never been in a stadium like this. It's going to be a spectacle when you tune in," he said. Markman expects more people will likely tune into this year's draft because it's expected to feature multiple quarterbacks like Sam Darnold from USC and Josh Rosen from UCLA, who could go in the first ten picks. "The perfect storm for us is household name quarterbacks who played at big schools and a lot of big teams at the top of the draft," Markman said. "When you have that scenario, it's a huge hit." ESPN is also hosting its first ever "College GameDay" live from the NFL draft. College football analyst Kirk Herbstreit will make his draft debut alongside stalwarts like Mel Kiper Jr. and anchor Trey Wingo. The draft will go beyond just cable coverage. Fox Sports will simulcast NFL Network's coverage for the first two days on broadcast television for the first time, while ABC will simulcast ESPN's day three broadcast.